I am a sucker for chocolate and peanut butter. I think you either love that combination or hate it. I know which side I’m on! I love it. I saw a picture on Pinterest for a goodie like the one pictured above and thought it looked like a treat. Apparently this is very similar to a treat you can find at Disneyland. I haven’t been to visit Mickey Mouse in quite some time so I can neither confirm nor deny if that is true, but I did think it was worth attempting at home. When I first started my evening treat, I thought it would come together in a matter of minutes, but this is not the case. I found that you need to let each layer set and freezing them after each step was mandatory. I think the treat was well worth the time; however, you should be prepared for some waiting around for the treat to finish. I also thought that this treat would be a great addition to your holiday treats. 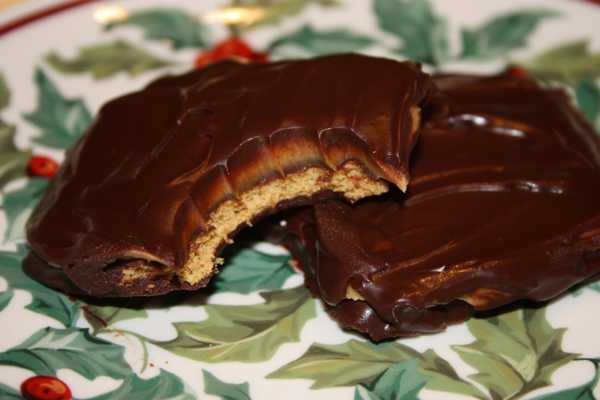 Dip each graham cracker square in the chocolate ganache covering the top and bottom of the cracker. 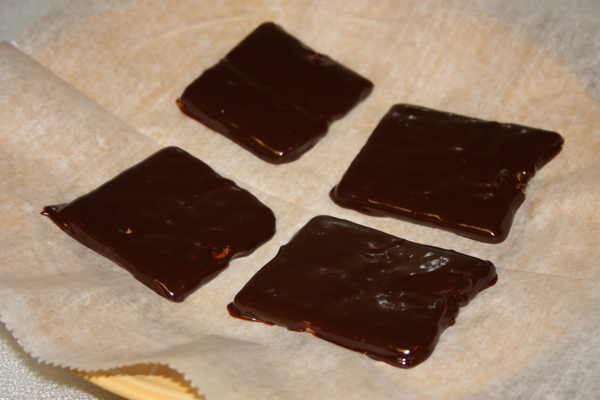 Place the dipped crackers on parchment or waxed paper. Place parchment sheet with the crackers in the freezer for 10 minutes or until set. 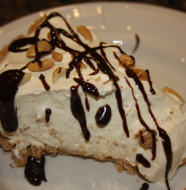 Remove from the freezer and slather the top with a good amount of peanut butter. 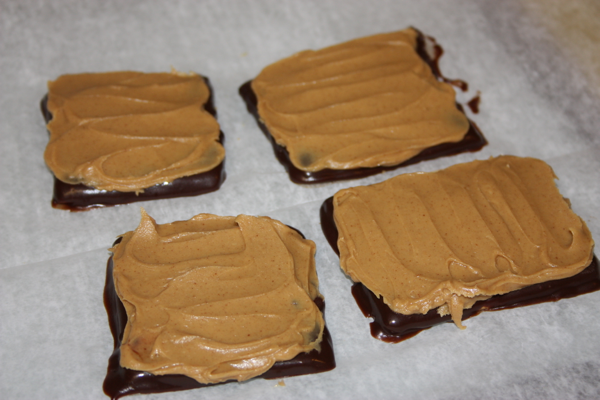 Place the sheet with the crackers back into the freezer until the peanut butter is firm (about 10 minutes). 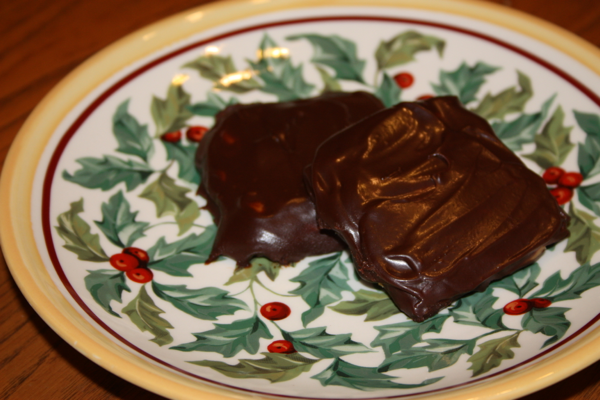 You may need to reheat the chocolate ganache if has hardened to much. Spoon some of the ganache over the peanut butter and smooth the ganache over the top and sides of each square. Drizzle ganache over the smoothed chocolate for decoration. Place the grahams back in the freezer for about 10 minutes. (I ate mine after 10 minutes but it was still soft. If you want your chocolate firmer you will need to keep it in the freezer longer.) Once they have set remove and enjoy! *For the ganache, combine 1 cup chocolate chips and 1/4-1/2 cup heavy cream or half and half in a 2-cup liquid measuring cup. Microwave on high in 30 second intervals stirring after each 30 seconds until smooth. When the ganache is smooth add 1/4 teaspoon instant espresso powder and stir until combined. 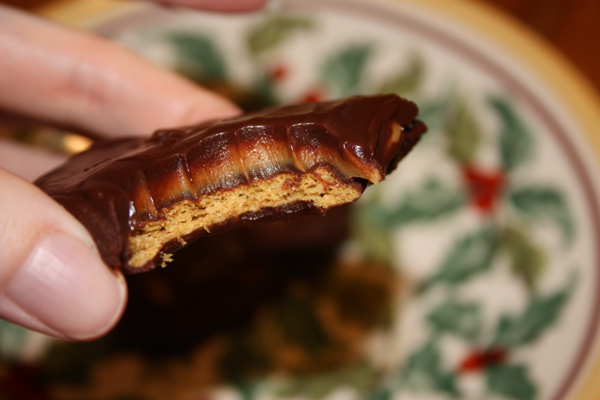 Chocolate covered grahams slathered in peanut butter.